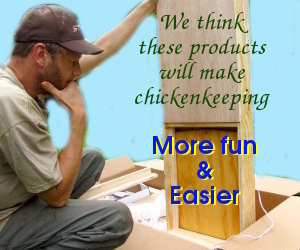 These PVC chicken feeders are a good way to store a whole bag of feed. If you have an issue with rodents stealing the food at night put a cap on the entrance while the chickens are sleeping. What would be nice is a motorized lid that would open back up at sunrise. Image credit goes to Errol Hess. I wonder if it would be possible to make something like that from metal downspout material? Here, storing chicken food in plastic is a good way to have rats gnaw right through it, I’d not trust a plastic cap to keep them away… I currently store my chook food in a metal garbage can, and feed the hens twice a day. Alison — Metal sounds like a possibility. If you do make something like that, I hope you’ll take photos and share them so we can let our other readers see another option!